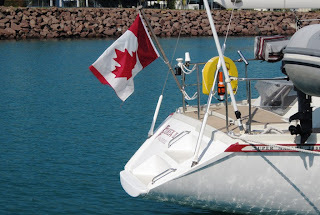 The last blog entry went as far north as Port Douglas which was an elegant small town with many nice restaurants and places to stay. It was also the end of civilization for the next several weeks as we moved into extreme northern Queensland and area with only Aboriginal reserves, national parks and some of the giant, legendary cattle stations (ranches). It is an area that combines sameness with variety and is very lonely. The only village we stopped at, Portland Roads, had a population of a few dozen. There are also a few Aboriginal villages but you can only stop there if you have made previous arrangements. In general it was a very interesting journey to a part of the world not well-known. The weather also was pretty consistent. There would be a few days of light winds from the SE, followed by a few days of heavy winds (25 to 35 knots) also from the SE. Since we were going generally NW it meant lots of broad reaching and running (genoa only, the assymetric did not get up) and more than a few gybes (only a few that were not planned and since the main was not up often, not a problem. For the most part, I will tell the story from the perspective of pictures. The first one is of the anchorage at Lizard Island (there are quite a few lizards wandering around that are in the 3 to 6 foot size range). It is very tall island and apparently the northern terminus of some Aussie cruisers. They come here and wait until the wind switches at the beginning of summer. They go south with the northerly winds that develop. We went to Lizard after a short (9 mile) run from the mainland in winds in the 30 to 35 range. The protection was quite good but the winds still were blowing like this for the couple of days we stayed. The picture was taken from the trail to the top of the island, which was a pretty challenging walk. 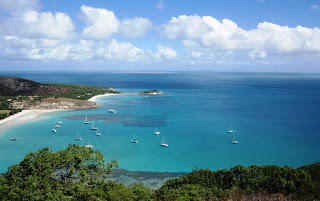 This picture was taken from the top of Lizard looking out toward the outside of the Great Barrier Reef. The spot is called Cook's lookout because he came here in 1770. The Great Barrier Reef gets closer and closer to the mainland the further north you go so that in some places it is less than 10 miles away. 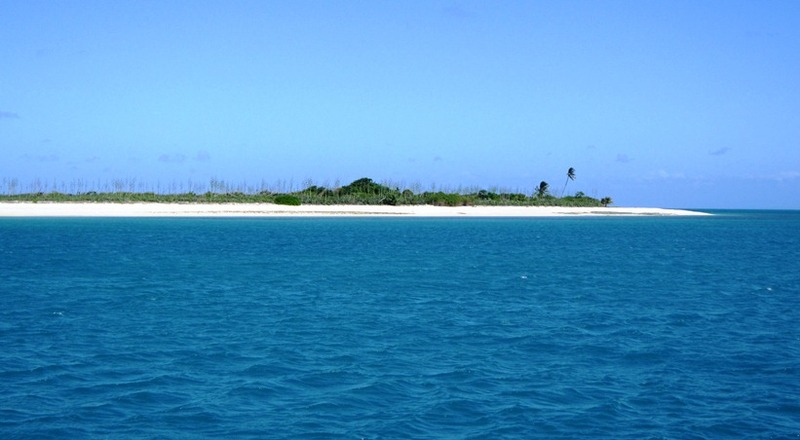 Cook did surveys as we went north and realized this fact and was very much afraid he might get embayed if the reef closed completely to the land (he did not know about the wind switching later in the year). He came to the top of Lizard and looked out toward the open ocean and could see a passage that he used to escape from the reef. BTW, a few months earlier his ship hit a reef (now called Endeavour Reef after his vessel) and was very fortunate to escape. He only got off the reef by throwing his cannon and many other heavy items over the side. Having come up through the reef with accurate charts (first survey by Cook), GPS, an engine, and depth sounder you stand in awe of people like Cook who had none of these. 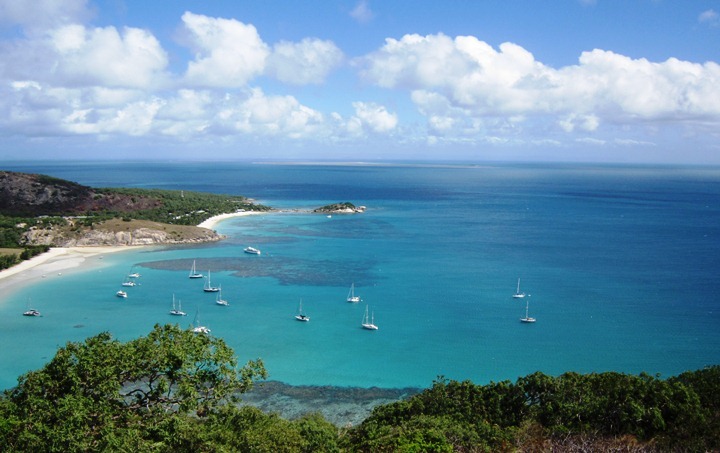 One of the realities of sailing this area are saltwater crocodiles. They were hunted almost to extinction in the past, but for the last 20+ years they have been protected and they are expanding their range. There were even some in Cairns harbour. This is lovely, tiny island that is part of the Reef. At low tide there was a long sandbar to the north that was probably half a mile long. Lovely spot for a walk, you say? Could be except for the croc that lives on the beach. More croc evidence. We spent a couple of nights in an excellent anchorage in the mouth of the Escape River, just south of Cape York at the northernmost point of Queensland. This boat was there about the same time. If you look at the Canadian flag you can see that most of the outer red stripe is gone. About 1 am, a croc jumped out of the water at the flag (they have a very small brain, but great killer instincts and physical power). He (she?) jumped again and bit the swim platform on the boat, breaking through the gelcoat and leaving tooth scratches on the bottom of the platform. 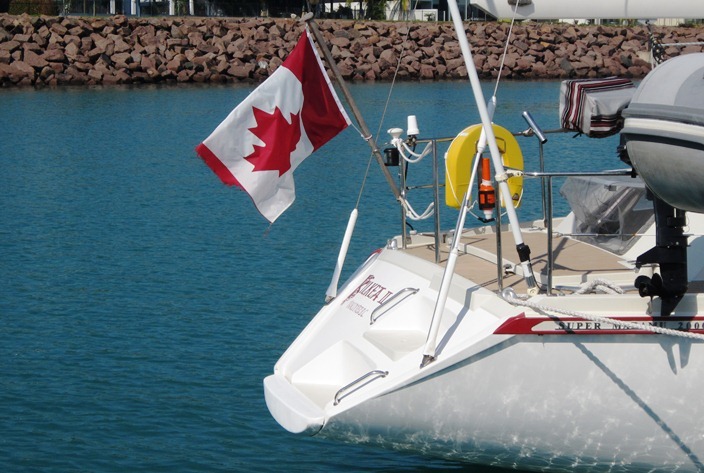 The couple were sleeping in the aft cabin very close to the action and thought they had been hit by another boat. A very friendly couple run a pearl farm in the Escape River (they invited us to visit, which lasted for about 5 hours. When we talked to the woman on the radio she said that the crocs in the river were well-fed and we should be fine as long as we kept moving in our dinghies - Oh, Mr Mercury Motor, don't fail us now. They have lovely place to live on a point at the entrance to the river, but there were small crocs on the beach there. 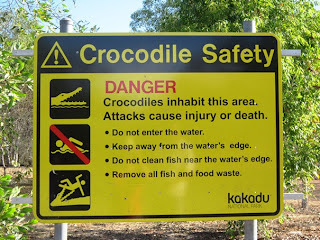 There are warning signs like this all over northern Australia and they mean it. You can't even stand near the edge of the water since this is prime hunting area for the beasts. As we headed to Darwin water temps went above 30°C and there were lovely beaches, but you coule not go swimming. 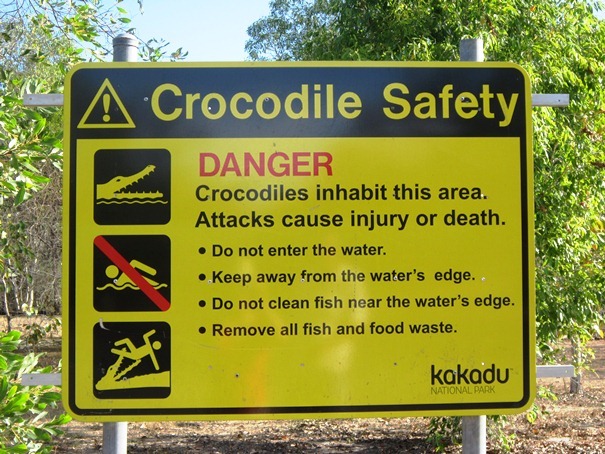 In Kakadu National Park (mentioned later) they say that the only save place to swim is the pool in the village. When one looks at a map of Australia and neighbouring countries it appears that there is a big piece of ocean between Cape York and Papua-New Guinea. 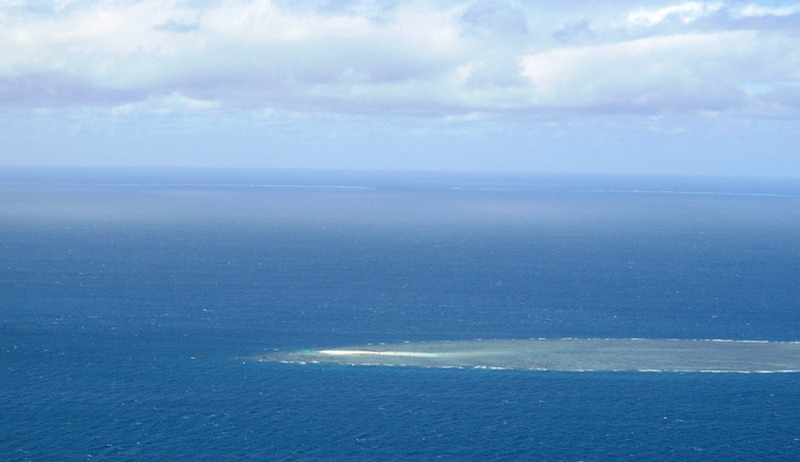 Turns out that this area (Torres Strait) is actually an extension of the Great Barrier Reef and is full of islands, shoals, and is all quite shallow - even extending out westward towards Darwin. 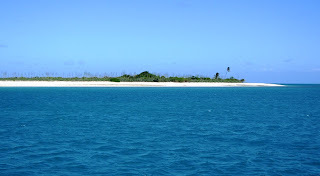 There was one spot that was 50 m deep right at Cape York but that was the deepest place we saw since north of Bundaberg. Our crossing of the top of the Gulf of Carpenteria (4 days) was not too bad. Our last day was blowing (the usual 30 to 35 knots) but at least the water was a bit deeper so the waves were not too bad. Boats that were a couple of days behind us had quite unpleasant conditons. THe highlight of our crossing was catching a 52" barracuda that weighed between 25 and 30 pounds. Quite a handful with only a handline. After finally getting him aboard I realized that we should hav bought a gaff rather than the big fishing net we have. We tried to lift him up with the net but only about half of him fit in and he did not like the idea. We finally just lifted him with the line. I thinked we ended up with 8 meals. Sorry the picture is the wrong way, it is vertical in the albumn but got turned here and I can't figure out how to turn it. When we got to Darwin we took the opportunity to head into the interior of the country in a rented campervan ($49 a night with unlimited mileage - one of the few bargains in the country other than the 30 cent ice cream cones at Mickey D's). We ended up driving more than 4000 km in a week. To be fair, there is not much else to do but drive. The distances are large and the towns are few. The third biggest city in the Northern Territory is Katherine which has a population of only 11,000. Alice Springs is not a whole lot bigger, but we had to go there after June read "A Town Like Alice". These are some of the rock paintings in Kakadu National Park. 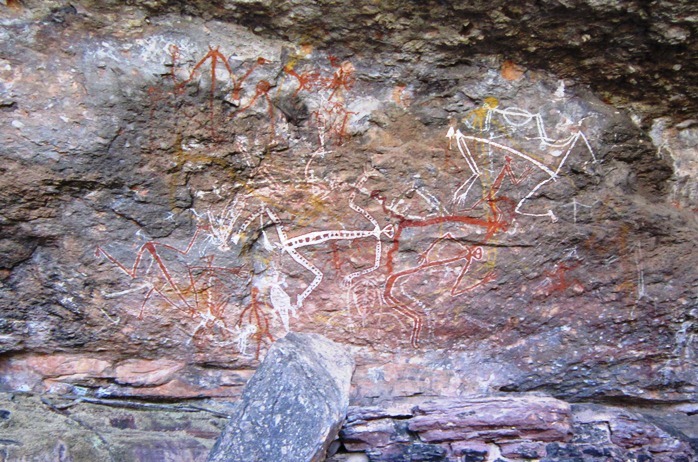 It is a World Heritage Site, likely because of the paintings that range from 26,000 years old to less than 30. 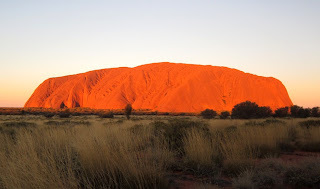 This is the famous rock called either Uluru or Ayer's Rock depending on your level of political correctness. It is quite remarkable at sunset, when this pic was taken. The colours are indeed accurate. We also got up before dawn, along with a few hundred other people, to see the sunrise on it - not worth disturbing the sleep. There is something quite odd happening here. 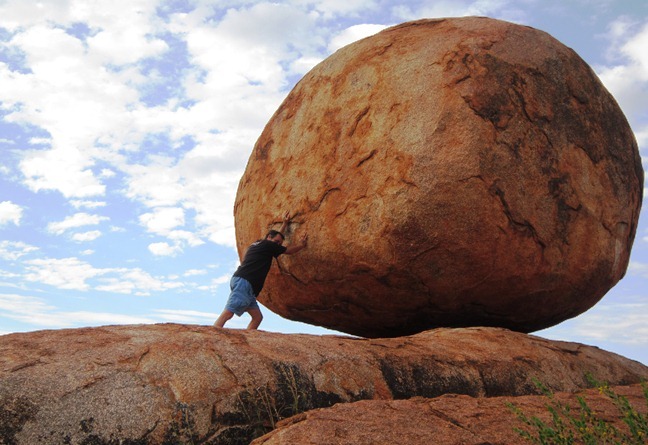 The rock is a sacred place for the local people and they do not want people to climb it. The national park people ask that you don't climb it, but don't actually stop you from climbing and have installed a rope handrail to help you with the climb (it is very steep). Why they don't just forbid climbing (which they do if it is too windy or wet) is beyond me? Driving down the 'Stuart Highway' which goes about 3000 km south to Adelaide is not like the long distance highways at home. It is only two lanes and that makes sense because there is really not that much traffic. Most common, about equal numbers, are rental campervans and small motorhomes. Next would the locals' vehicles which are, in the countryside, overwhelmingly small diesel trucks (not pickups) with snorkels for the air intakes. These reach up to the top of the roof and allow the vehicles to go through quite deep water when the road floods - which is very, very common in the wet season. Back to crocs, we were told that you have to be very careful when you drive through flooded bits not to get stuck since you can't really get out run a cable ashore or to get help because the crocs really spread out in the wet season. Anyway, back to the highways. 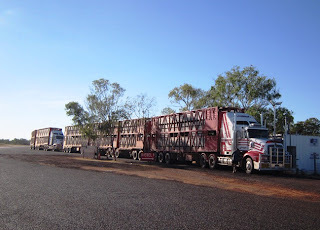 This picture is of a couple of 'road trains'. These are a tractor with either three or four tralers behind. The length limit is 53.5 m! We saw one carrying dry cement (4 trailers) and it was and 82-wheeler. If you want to pass one of these monsters in a gutless Mitsubishi campervan with over 200k on the odometer you want to be able to see a long way ahead. This was an interesting spot along the highway called the Devil's Marbles. It is a large area of eroded granite. This was about the most extreme of all. You wonder how many years (or centuries) it will be until the little join breaks away. We did see kangaroos. 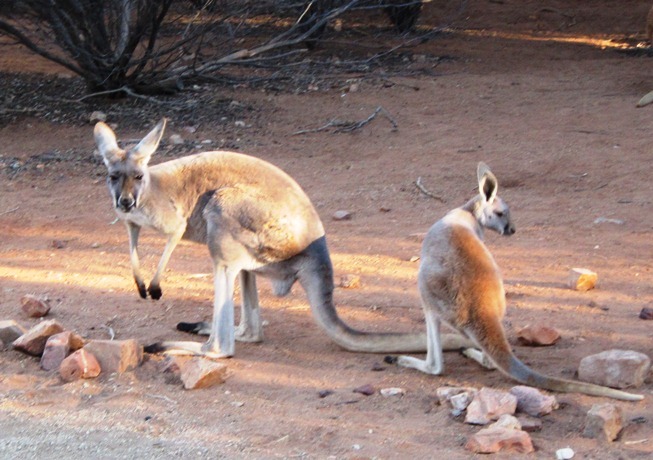 These are in a zoo in Alice Springs where they let you wander through the 'roo enclosure. Later we saw a mother and baby (joey?) right next to the road just after dawn. When we got quite close (20 m) the baby decided he had had enough of the scary world and dove into the pouch. 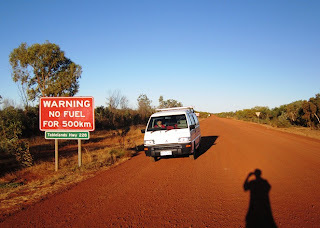 We did not go on this road because our rental agreement only allowed us on 'sealed' roads. The picture is good for showing a) how red the soil is in the 'Red Centre' and the kind of secondary roads there are in the country, with no gas (or settlement other than cattle stations) for 500 km). BTW, the redness of the soil is the result of tremendous amounts of leaching of nutrients for many thousands of years. All that is left in the soil are the insoluble minerals like iron and aluminum - so what we end up seeing is really a lot of 'rust' in the soil as the iron oxidizes. Just so you don't think we were only concerned about crocs, at the zoo in Alice Spring we saw a fairly small snake called the 'Desert Death Adder'. The guide said that it was on the list of the 10 deadliest snakes in the world but not near the top. She did say that if you were bitten you better have the anti-venom with you because you would never make it to the hospital. You mentioned that the deadliest of all is called the Great Brown. The problem with these guys is that they are very aggressive and will chase you (nice thought). She said that if you see any small to medium-sized snakes in Oz you should back away from them but if the snake is large it should be Ok, except that we saw a python that was 19 feet long and looked like it could look after itself. A few comments about the city of Darwin. It is a lovely spot and would be a great place to live - for about 5 months of the year. This is the dead of winter here and every day the high as been about 30C with bright sun. You can tell it is winter because some of the locals wear a woolen sweater (jumper) over their longsleeved shirts, even at midday. The problem here is the other 7 months. In midsummer it often reaches 43°C with high humidity and lots of rain. Darwin and the adjacent parts of the Northern Territory (the residents are called 'Territorians') have a fairly brief history that is dominated by two events - World War II and Cyclone Tracy. If you have ever wondered what the Japanese fleet did after Pearl Harbor, they came to waters north of here and bombed Darwin in Feb., 1942. In fact, more than four times as many bombs were dropped here than in Hawaii and hundreds of people were killed (many women and children had already been evacuated or the toll might have been much worse. Many people thought that an invasion would follow and there certainly was nothing here to stop them. Apparently the Japanese navy wanted an invasion and the army thought that they would be spread too thinly. The Australian government took the threat seriously and had a secret plan to pull back to a line at the latitude of Brisbane. As we drove south we past signs pointing to the locations of many WWII airports stretching quite far south. Tracy hit Darwin on Christmas Day in 1974 and is the largest natural disaster in Australian history. It was a Category 4 hurricane and one of the most compact hurricanes ever recorded. More than 60% of the buildings and 80% of the homes were destroyed and dozens were killed. The result is a very modern-looking city since few homes predate the storm and many of the surviving buildings have been modernized at some point in the past 30+ years. Posted by Bruce at 2:29 a.m.
August 4, 2012 at 9:14 a.m.